Setting up the Developer Tools is relatively easy if you follow the steps below. Once you do this, the Excel Options window will open. Use the left hand radio box to select all tabs, then look for the Developer selection listed in the left hand column. Click on this, and it should be highlighted. Then press the Add >> button in the middle of the screen. Click OK near the bottom. Once this is done, you will have a new tab labeled “Developer” in Excel. 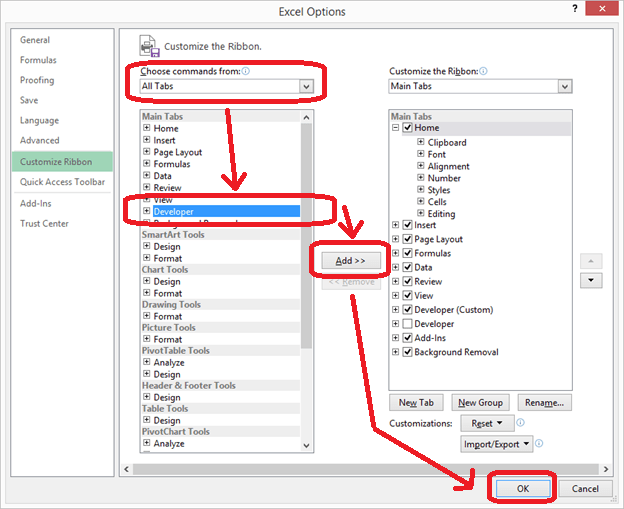 Steps to add the developer tab in Excel. This method can be used to add other commands or groups of commands to your toolbar. If there is a particular command you use often, it is helpful to add it.